A new world opened to me the day I bought a 1919 2H Henderson in March 1993. I am a Baptist minister and a member of the congregation showed me a collection of vintage cars and motor bikes a friend of his had. It so turned out that his friend and I went to school together and so began a friendship which has continued. This persons father had collected and restored cars and some motorcycles over a period of fifty years. The Henderson was one he had bought but never restored before he died. Three things attracted me to buy the bike and restore it. Firstly, as a teenager I spent many night hours with my brother-in-law fixing motorcycles and in those years I owned a Triumph and Matchless. Once out of my teens I no longer had an interest in motorcycles but that early involvement obviously had left its mark to surface over thirty years later. Secondly, I had a interest in historical things having completed studies on the pacific region and was involved in teaching history. Thirdly, it seemed to me a good idea to pick up a hobby that was something different from the people-centred ministry I was involved in as a pastor. 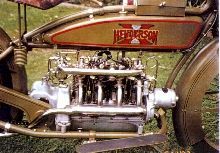 The four cylinder Henderson thus caught my imagination. I put a deposit on the bike and a new world opened up for me. Later that year and before I had taken delivery of the bike I was due for long service leave. During that time I was going to Europe and the USA to visit a number of churches. Being a historian I determined to find out as much as I could about the Henderson. My wife and I first stayed in England and as I had heard about the National Motorcycle Museum at Birmingham I enthusiastically took a day trip from London to see if a Henderson may be on display. I soon realised how naive I was as only British bikes were on display. I visited other museums and while I enjoyed seeing the bikes I did not come across any one who knew of any Hendersons in England. I have no doubt that there were but I could not locate any. I then thought that in going on to the USA that I would surely see some there. I had made some enquiries in Australia and was able to get two addresses of people who commercially dealt with Hendersons. On arrival in Los Angeles I soon made contact with Dean Salmans and made a bus trip across the city to see him. He graciously picked me up at the bus stop and took me to his place. I soon found out though that he had very few parts on pre 1920 models and that these bikes were fairly scarce. With only a short time in the USA I rang Henderson Motorcycle company in Missouri and had a good chat with Steve Shackman and followed this contact up with letters. In all of this I was picking up information on the Hendersons and those I contacted were only too willing to help me and answer my questions. I then left the USA disappointed that I could not locate any pre 1920 Henderson. With the contacts I now have I am sure the story would have been different. On returning to Australia across the Pacific we stayed in New Zealand for a couple of weeks. In following up a contact I was referred to Steve Raffils in Auckland. To my surprise I found that his main business was on working with Hendersons. He had even reproduced crankcases for people overseas. As I was going to Christchurch in the South Island he gave me a contact and for the first time I saw a H model Henderson being restored. It was now starting to dawn on me that there were a number of Hendersons in countries outside of the USA and that often these bikes were kept and not scrapped as it seemed to me to be the case in the USA. Recently Steve mentioned that there are about fifteen pre 1920 Hendersons in New Zealand of which three are in going order. On arriving back in Adelaide I collected the bike and sought to find out others in Australia who had pre 1920 Hendersons. I found two people in Adelaide and made contact with others around Australia. In all there seems to be about fifteen pre 1920 bikes that are slowly being restored or are awaiting to be worked on. At this point of time at the beginning of 1999, my bike seems to be the only one that is going and is probably one of the most original ones. In the process I have made some good friends who have been most willing to help me in my restoration project. I have become a part of an amazing network of people who have great enthusiasm about the Henderson motorcycle. One of the owners in Adelaide has always been available to give advice when I needed it. People in other states are willing to spend ages on the telephone to talk about the bikes. I have developed friendships over the phone with two men in particular who I am sure have run up a huge telephone bill. Gary Warfield of Queensland and David Moore of Tasmania have given me a lot of information on Hendersons. As a novice to the game I know I started with a fairly rare and large bike and have needed quite a bit of advice. These men have made parts that I have had missing such as the kickstarter, chainguard and headlight reflector. In return I have let them copy parts of my bike. To me it has been an amazing process and it has opened a new world of friendship and interest. The person from my church who introduced me to the bike now makes Penny Fathings and has helped with welding while the person who sold me the bike has continued to help with workshop facilities and tools. In addition I have now joined the Veteran & Vintage Motorcycle club of South Australia where people have been only too willing to help me in getting the bike out for a rally. The bike itself was originally bought here in Adelaide and the owner attached a wicker sidecar and used it until about 1930-32. At that time he left it running outside a shop in one of the main streets of Adelaide called Rundle Street. A bystander revved the motor and broke the crankshaft. This I have found has been a weakness with the earlier Hendersons. The owner pulled the engine apart and ordered a new crankshaft but never got around to assembling the bike. It remained in a small iron shed for the next 25 years with rats making their nests in the sidecar. In 1957 an enthusiastic motorcycle restorer heard of its existence and went and bought it. The wicker sidecar had by this time been destroyed by the rats. The engine was in pieces and in a box with the bottom rotted out. Some parts were left to rust on the dirt floor. The engine was badly worn and the new owner knew that it would take a tremendous effort to restore it. Because of this and with pressure from Jack Cains to buy it he finally decided to sell it. He now regrets that decision as with further experience in restoring bikes he knows he could have done it. Jack Cains, who later started the Birdwood Museum in the Adelaide Hills to house what has become the foremost collection of cars and motorcycles in Australia, had a friend start to restore it during the early 1960s. This person wasnt into restoring it to its original form and painted the olive drab frame black and the rest of the bike the wrong colour green. He also obtained a 1917/18 engine and put that in the bike. He never completed the restoration and finally the father of my friend purchased it and it stayed in his shed until I bought it. In the process of changing hands a few parts went missing as mentioned above. Unfortunately the sidecar frame has also disappeared. The one main part still missing is the battery box. If any reader knows of one I would be keen to get the dimensions and if possible a photo of it. Some of the other Hendersons in Australia are also electric models but none of them have an original battery box. I have the switch box which was still the original colour and provided an excellent sample for painting the rest of the bike. One interesting factor was that of all the early Hendersons in Australia only two or three have the original kickstarter. 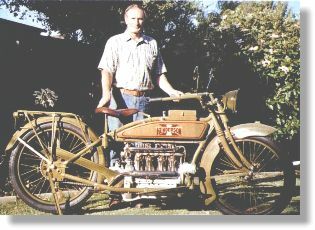 This shows another weakness in the bike which Henderson recognised in 1918 when it increased the number of screws to hold the kickstarter to the crankcase. Until I got the kickstarter I started the bike by putting the engine in third gear and with the bike on its stand pulled the back wheel over. With priming the engine I was amazed how easy it was to start. In the five years that it took me to restore the bike I had two years in Papua New Guinea on missionary work. I have kept the 1917 engine in the bike as the original engine will take quite a bit of work to restore. The original also does not look as nice. 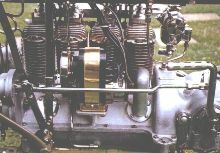 The 2H engine was one of the advertised "win the war" models in 1919 and had the crankcase painted olive drab and possibly the cylinders painted black instead of nickel plated. The restoration of this engine will be a job for retirement. It will be noticed too in the photographs that I have not been able to replace the handlebar grips and if any reader knows where I could procure these I would be glad to hear from you. The person who bought the bike back in 1957 has seen the restored bike and recalls that it did not have the large red 'X' on the tank and also said that it had white tyres. It would seem that the exported 2H model was made early in the Excelsior take over from Henderson and still had the 1918 Henderson tank transfer. Starting with a Henderson was a very ambitious task for someone new to restoring vintage motorbikes. At times I wondered what I had let myself in for but I have learnt a lot through it and I would have had it no other way. I have enjoyed the process and now have a very fine bike to ride. It is so smooth and takes very little throttle to bring it up to the speed limit of 35 mph around the city. I have had to get a bicycle electronic speedometer to ensure that I don't go over the speed limit. A new world of friendships have opened up to me as well because of Hendersons down under.